For many years, as both an end user and industrial hygienist, I assumed chemical protective glove selection was similar to selecting other forms of protective clothing and equipment, such as a respirator. I assumed that all the products met similar manufacturing standards and that all I needed to select the proper gloves was general chemical resistance charts. It was not until I started researching chemical- resistant gloves that I realized these assumptions did not always hold true. The goal of this article is to share my years of research on gloves and provide industrial hygienists a set of guidelines and tools for improved selection and use of chemical-resistant gloves. TYPES OF MATERIALS Many different types of polymers are used in glove products. Some products may even combine or blend two or more polymers. 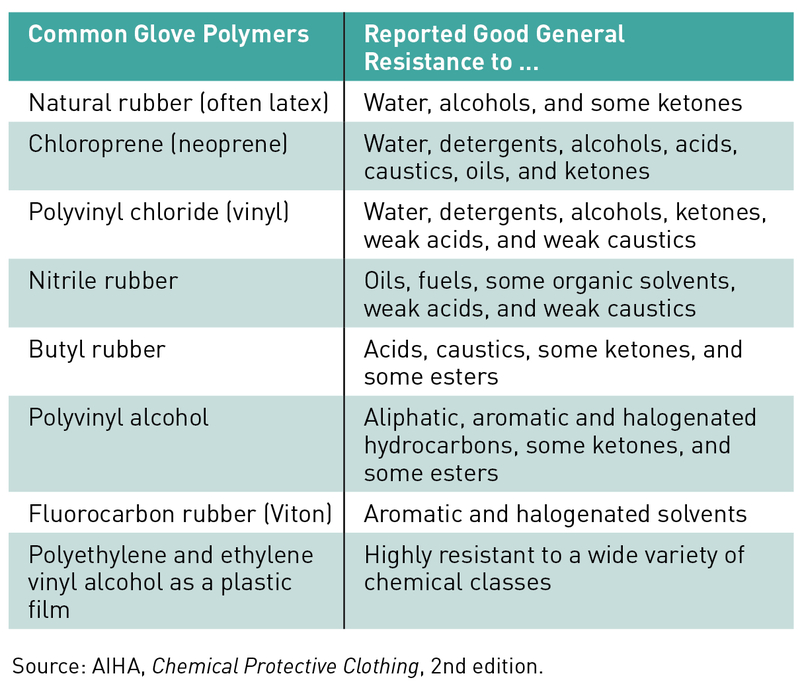 Table 1 below lists polymers common to gloves used for protection against chemical exposures. RESOURCES AIHA: Chemical Protective Clothing, Second Edition (2003). Applied Occupational and Environmental Hygiene: “A Critique of Assumptions about Selecting Chemical-Resistant Gloves: A Case for Workplace Evaluation of Glove Efficacy” (November 2010). Journal of Applied Polymer Science: “Acrylonitrile Content as a Predictor of Captan Permeation Resistance for Disposable Nitrile Rubber Gloves” (November 2006). Journal of Applied Polymer Science: “Polymer Properties Associated with Chemical Permeation Performance of Disposable Nitrile Rubber Gloves” (September 2014). Journal of Occupational and Environmental Hygiene: “Changes in Chemical Permeation of Disposable Latex, Nitrile and Vinyl Gloves Exposed to Simulated Movement” (April 2014). Journal of Occupational and Environmental Hygiene: “Chemical Resistance of Disposable Nitrile Gloves Exposed to Simulated Movement” (September 2012). Journal of Occupational and Environmental Hygiene: “Evaluating Polymer Degradation with Complex Mixtures Using a Simplified Surface Area Method” (September 2017). TESTING CHEMICAL RESISTANCE One underlying principle with chemical resistance is “like dissolves like” and that each polymer provides resistance to chemicals based on solubility. However, there are deviations from this concept, and selection cannot rely solely on solubility. One issue is that most products contain a variety of additives, which may affect solubility. Another issue is that not all chemical exposures involve pure compounds. Thus, chemical resistance testing of the glove product against the specific chemical hazards is highly recommended. The three main types of testing used to assess chemical resistance are penetration, chemical degradation, and chemical permeation testing. Penetration testing. Penetration refers to the mass flow of a liquid or gas through small holes or defects. Penetration is often assessed using chemical, water, or air leak testing. 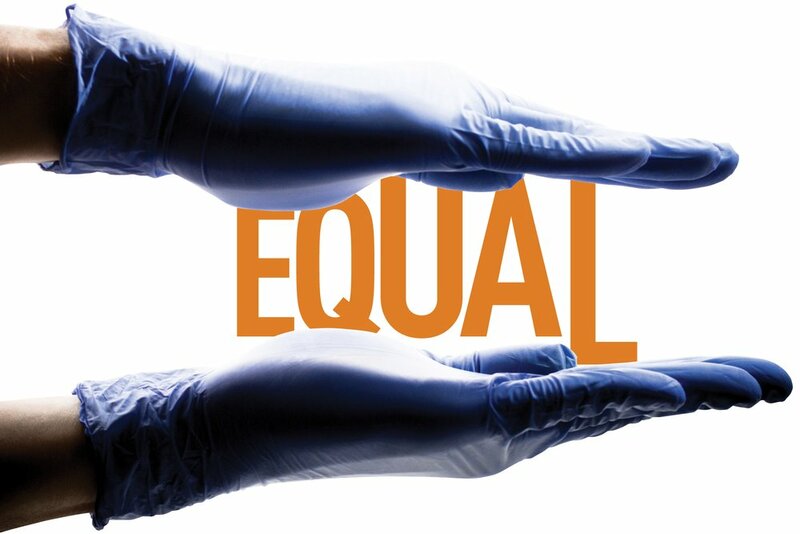 Common glove penetration standards include American Society for Testing and Materials Methods F903 and D5151, U.S. Food and Drug Administration method for medical exam gloves (21 CFR 800.20), and European Union Method 374-2. Many of these standards refer to an acceptable quality level, or AQL, ranging from about 0.65 to 4.0, related to the number of defects detected per 100 gloves. Even though some of these tests are more common for medical gloves, chemical exposures are likely to be much higher with passage through a hole. Selecting a glove with a low probability of a defect or hole is critical to protect against chemicals. Chemical degradation testing. Degradation refers to the change in one or more physical properties of the product in contact with a chemical hazard. The product is put in contact with the chemical at a set time and temperature and then evaluated for physical changes in color, shape, weight, thickness, and/or tensile strength, among other parameters. Common testing standards include ASTM D471 and EN 374-4. Chemical permeation testing. Chemical permeation testing evaluates the molecular movement of a chemical hazard through the polymer, in the absence of penetration or degradation. Common testing standards include ASTM F739 and EN 374-3. The two primary measures of permeation are the breakthrough time and permeation rate. The BT is the time, in minutes, to first detection of the chemical passing through the polymer. The PR is generally either the maximum rate of permeation or the steady-state rate, given in units of µg/cm2/min. Together the BT and PR give a picture of “how soon” and “how fast” the chemical will permeate through the polymer. Figure 1 illustrates an example permeation curve, with the added area under the curve discussed later. Figure 1. 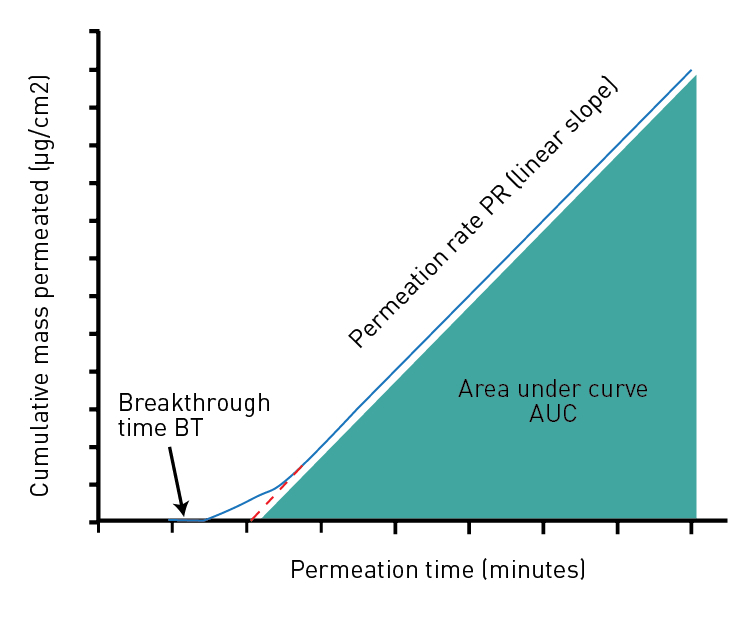 Example permeation curve showing breakthrough time, permeation rate, and area under curve. Tap on the figure to open a larger version in your browser. WHAT DO INDUSTRIAL HYGIENISTS NEED TO KNOW? The goal when selecting chemical-resistant gloves is to prevent skin contact and worker exposure. As stated earlier, this may not be as simple as looking at a chemical resistance chart and selecting a product rated as “excellent” over another rated as “poor.” However, industrial hygienists can use the following general guidelines to help ensure adequate worker protection. Assume the Level of Protection May Be Less Than Expected General guidelines may not reflect true performance. In the absence of product testing, the level of protection may be much less. According to several studies published in the Journal of Occupational and Environmental Hygiene and the Journal of Applied Polymer Science, the variability in chemical permeation among brands is high, with up to 10-fold differences in BT and 200-fold differences in PR. Lot variability can also vary by as much as twofold. In addition, even with available product testing, the performance under conditions of use can be significantly less than expected. Many permeation tests are performed at room temperature under static conditions, which do not account for hand temperature and movement. An article in Applied Occupational and Environmental Hygiene indicates that hand temperature alone can decrease BT by up to threefold and increase PR by up to 2.5-fold. Studies published in JOEH also indicate that hand movement can decrease BT by up to 35 percent while increasing PR by up to 80 percent. The combined effect of hand temperature and movement can significantly increase the risk of exposure. Use Available Data and Additional Tests in the Selection Process General chemical resistance guides are still useful, as they allow for selection of a material that should perform better than others. The key is to use available penetration, degradation, and permeation data in the selection process. This valuable starting point can help narrow down the choices. Additional calculations and tests can then be used to select a product that should perform better than other products would. The steps are summarized below. Select products with available penetration data. The lower the AQL, the less likely there will be holes or defects that allow the chemical to pass easily through the glove upon contact. Evaluate degradation and select a product that does not readily degrade. In the absence of degradation data for a specific chemical or mixture of chemicals, simple tests can be performed. One method is to expose a sample of the material to the chemical for at least 24 hours and then evaluate it for signs of degradation. Look for discoloration, deformation, shrinkage, or swelling. 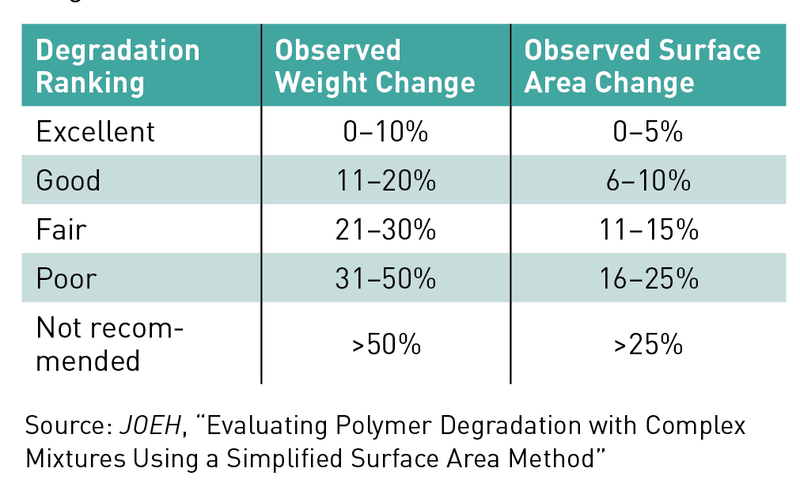 Weight change or surface area change can be used to evaluate and rank degradation (see Table 2). A recent paper in JOEH outlines both of these methods as well as use of a digital scanner and free software to evaluate surface area changes. Evaluate chemical permeation using both BT and PR, when available. Calculation of an AUC can be used to estimate the combined effects of both BT and PR, while also taking into account the exposure duration. This is similar to a dose calculation in toxicology and is a more appropriate estimate of exposure over time. See the sidebar on page 29 for a discussion of how differences in BT and PR can affect the AUC. When critical, additional tests can be used to evaluate permeation resistance. Two factors known to influence chemical permeation are glove thickness and area density, or AD. Glove thickness is often reported by the manufacturer or it can be measured using a micrometer. Thicker gloves will provide more chemical resistance, but slight differences in thickness, such as 5 mil versus 6 mil, are not likely to make much of a difference. Doubling or tripling the thickness would make a significant difference. However, thicker gloves may greatly reduce user comfort and dexterity. According to studies in JAPS and JOEH, AD is better correlated with chemical resistance when thickness does not vary much among similar products. Determining AD can require use of an analytical balance, but the technique and calculation are simple to perform. First, a predetermined area (say, 5cm2) is cut from the palm region of the glove. Next, the cut sample is weighed on a balance in grams or milligrams. The AD is the weight per area. Tap on the table to open a larger version in your browser. Establish procedures for reducing cross- contamination, such as designating areas and items for glove versus non-glove use, and establish decontamination procedures when necessary. With a gloved hand, pinch and hold the outside of the other glove near the wrist. Carefully peel the glove off downward toward the fingers, turning the glove inside out. Fully remove the inside-out glove and hold it in the remaining gloved hand. With the ungloved hand, slide two fingers under the cuff of the remaining glove, without touching the outer surface. If contamination near the cuff is suspected, then use a clean wipe or paper towel to protect the fingers from contamination. Repeat step 2, peeling the glove downward and turning it inside out with the first glove trapped inside it. Remove the second inside-out glove and dispose of it appropriately. Thoroughly wash hands with soap and water or an appropriate skin decontamination agent. Double Gloving Can Provide Extra Protection When Needed Double gloving can reduce exposures caused by permeation. This is because there are now two breakthrough times and a boundary change between the two gloves. Double gloving is best for short-duration scenarios, as longer use is likely to lead to increased discomfort, hand fatigue, and ergonomic issues. STEPS TO PROTECT WORKERS The selection and use of chemical-resistant gloves is a little more complicated than selecting other forms of protective clothing. Not all glove products will perform the same, and general chemical resistance guides do not always represent those differences. The ways that gloves are used in the workplace are also likely to affect their performance. However, the steps discussed in this article will help ensure we select a product that performs as intended and that workers are adequately protected. ROBERT N. PHALEN, PHD, CIH, is an associate professor of Industrial Hygiene at University of Houston-Clear Lake in Houston, Texas. He can be reached via email or (281) 283-3753. Send feedback to The Synergist.